You don't have to know me well to know I'm a sucker for used furniture whether it be flea market finds, Craigslist scores or even curbside treasures. But no matter how tempting a piece or how low the price, there is one looming risk that is always at the back of my mind: the dreaded bed bug. 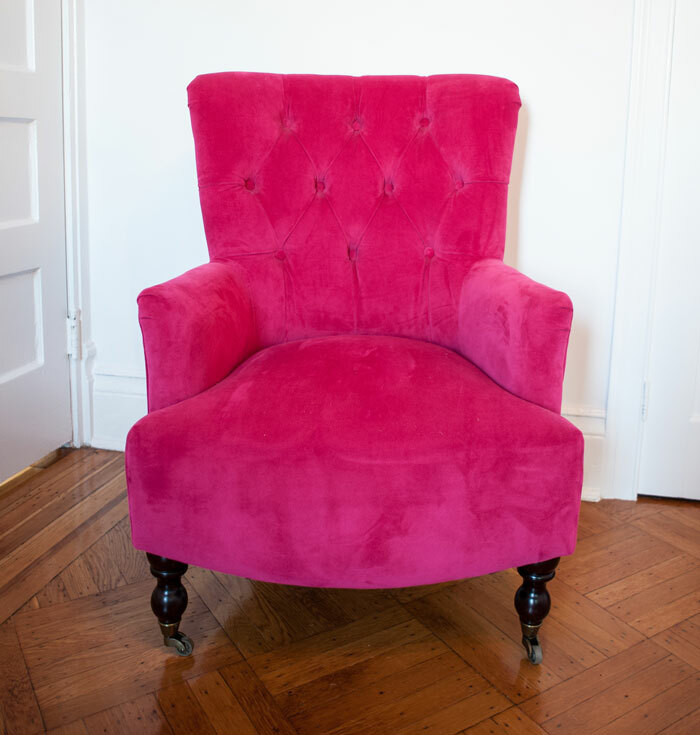 Case in point this perfect pink tufted chair that I knew my daughter would love in her room and was being sold for a steal! Bed bugs are a scourge for anyone but especially for lovers of used furniture! So I'm quite careful in what I bring home, following a simple but strict system for how to keep those little nasties out of our house. While nothing is foolproof, I'd like to think my system works pretty well. Perhaps it can help you as well. I've been asked about how I deal with this quite a few times so it seemed like a great time to share. First things first - you must INSPECT. And I don't mean a cursory glance. Bring a flashlight and a magnifying glass if necessary. These bugs are great hiders but there are some tell-tale signs you can spot if you look carefully in seams including pinprick stains the bugs leave behind, molted skins or even the bugs themselves. Consider the risk of the item itself - something like a mattress or any soft item in a bedroom is going to be more likely to be an issue then say a kitchen stool or a hallway table. Consider the source of the find. I always prefer to talk to the previous owner if possible to get a sense of why the item is being discarded. While bed bugs don't discriminate, I always tend to feel better to find out the backstory. 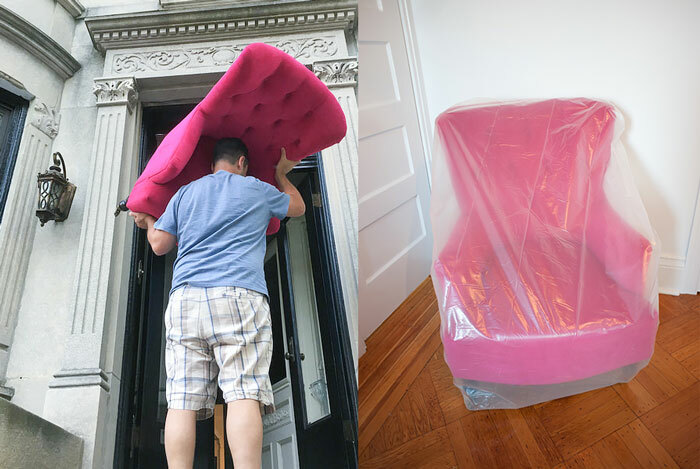 Once you've given it a throughout once over and feel pretty confident the item is pest free, it's time to get it home. The next step is ISOLATION. If you can, place the item in your garage, basement or even your bathtub for a few days and inspect again just to be sure. Since I don't have a completely isolated space, I create my own by wrapping the item in plastic and letting it sit for as long as practical. With that step behind me, I like to do one final step in making sure I haven't missed anything and that's TREATMENT. 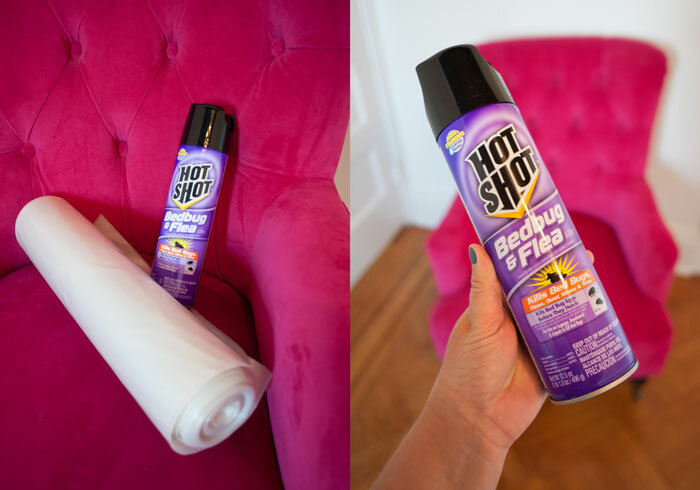 I use a large plastic drop cloth and Hot Shot® Bedbug & Flea Killer Aerosol. This product is water based so less likely to stain, affordable and kills both live bed bugs and eggs before they hatch. I lay out the drop cloth, use the product as instructed. Always read the label before use! Once it's gone through my system, I breathe a sigh of relief and feel so much more comfortable using the item in my home. Disclosure: This post has been sponsored by Hot Shot® Brand but all opinions expressed are my own. Bed bugs never once occurred to me. Thanks for the heads-up! And don't forget you can (hopefully not) bring bedbugs home yourself from a hotel or holiday spot...... Thanks for this, it is good to remind people that there is a cure for the varmints!! And oh! that chair! No wonder you had to have it. It is glorious! What a great chair! I know this is a sponsored post, but I have found a non-chemical method that really got rid of this problem for us. I used a heavy duty steam cleaner (steam kills both bugs and eggs) to rid our place of the pests several years ago, and now use it on a monthly basis to get rid of any hitchhikers. (we travel a lot and living in NY it is not a matter of "if you get bedbugs"...it's a matter of "when you get bedbugs") The cleaner I chose is a vapamore, but any heavy duty large capacity steamer works. Steaming a chair like this would be very simple and any nooks and crannies could be reached with one of the many tools that are included. and like I said...no chemicals....and CLEAN...super clean.